Free passes for "The Town"
Last week we were talking about certain advance screenings that we would love to host. The Town was pretty high on that list. If you have seen the trailer, you know why (if not, see it below) – The Town looks intense, unpredictable and powerful. Ben Affleck (State of Play) stars as a Boston bank robber whose crooked life takes an unexpected turn when he falls for a girl that he takes hostage during a heist (Rebecca Hall, Vicky Christina Barcelona). 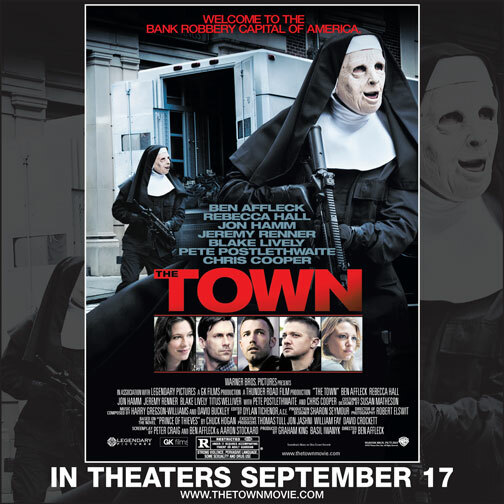 The Reel Place will be hosting a free screening of The Town in Salt Lake City, Utah on Monday, September 13 at 7:00PM. To get you passes, click here or on the poster image above. The link will take you to a site called Gofobo. If you do not have a Gofobo account you will need to create one – it is an easy way to get free passes to advance screenings. Note: just because you have printed passes for the screening does ensure that you will get in. You must exchange your passes for actual tickets on the afternoon of the screening. Most theaters begin exchanging them around 4PM. Check with the box office for an exact time. This screening will sell out. Please also note that The Town is rated R for strong violence, pervasive language, some sexuality and drug use. Anyone under the age of 17 that is not accompanied by an adult will not be admitted to the theater. Security will be checking IDs at the door.